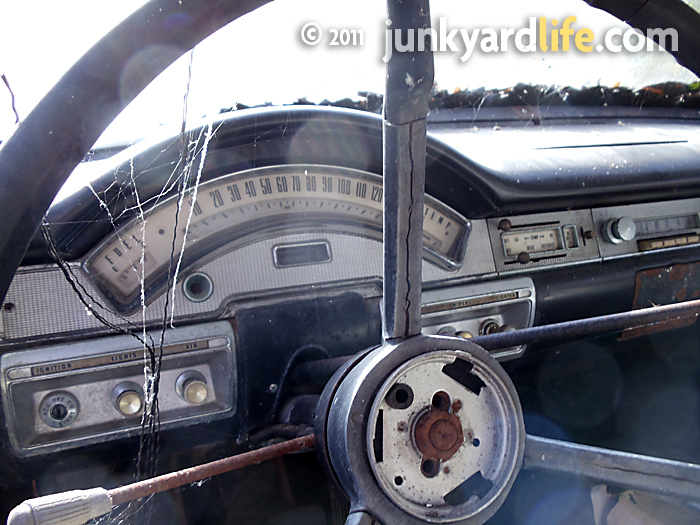 Tour a remote Tennessee junkyard that serves customers around the globe. Under1981.com Antique Auto Parts is a private junkyard that does 99.9% of its business via the Internet and is owned and operated by a guy who is known only as "Murf." 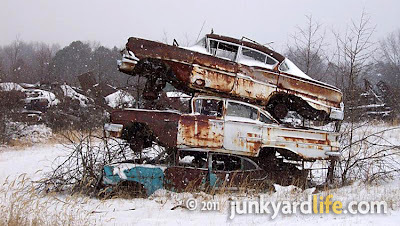 Murf's 7-acre junkyard is loaded with more than 125 vehicles built before 1981 and includes thousands of loose parts that have been pulled from vehicles that were dying for a date with the crusher. "They can't all be restored, where would you get the parts?,” said Murf. 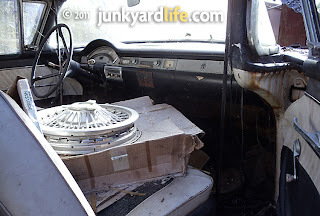 I know, it's not always a pretty picture but Murf and his wife, Lorrie, have found a way to move hard-to-find parts from the backwoods of Grimsley, Tennessee into the hands of customers as far away as Serbia, Australia and the Netherlands. 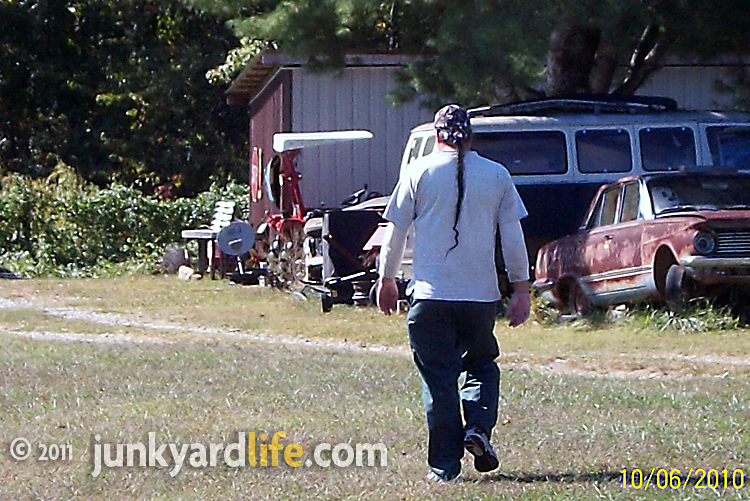 Murf, the owner of Under1981.com, walking to his shop in Grimsley, Tennessee. Murf’s junkyard, which is also basically his home, has been operating for 5 years and is open for business to the public but not to just anybody. "I only let people come in to pick up parts by appointment only,” said Murf. 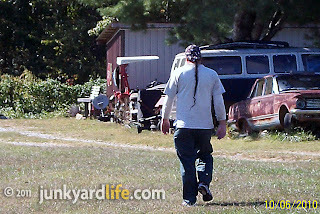 “My place is barely visible from the road and I’m not even open to locals, except by word of mouth.” Murf’s wife, Lorrie, operates the website side of the business where customers are encouraged to email their parts request and be patient, not just ‘show up’ and ‘walk around.’ Murf and Lorrie stay busy interacting with customers and may answer more than 100 emails concerning parts per day. A high tech junkyard with solo manpower is hard work no matter how fast the Internet connection. 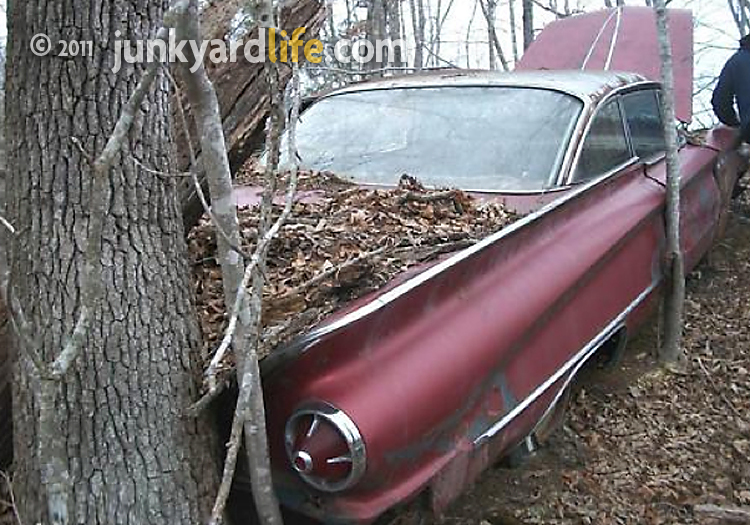 Murf sold some parts from this 1960 Buick Invicta before it was crushed by another yard. 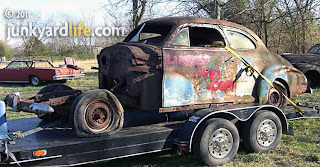 You may even find a 1939 Ford coupe at Under1981.com. 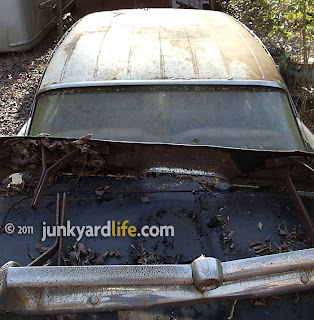 Murf, 47, loves old cars and is in the business of saving what he can from the crusher. “Sheet metal pieces are my most requested item,” said Murf. “I will cut anything up.” Currently the oldest car in Murf’s yard is a 1946 Ford and his favorite is a 1961 Olds. “I like different,” said Murf. 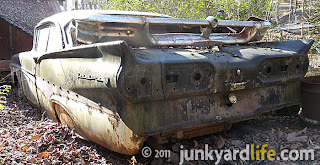 He is also a guy willing to spend countless hours salvaging parts from junkyards that are ready to ‘crush out.’ Murf only hauls absolutely useless pieces that will fit in a bucket to the scrap yard. 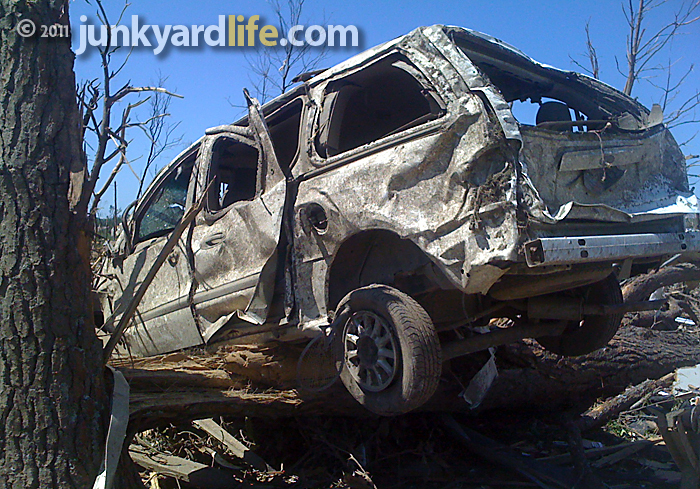 “I hauled the remains of six cars in the back of a pickup truck. Imagine six cars in the back of a pickup,” Murf said. It’s amazing what one little junkyard in Tennessee can do to keep the old car hobby alive on a global scale. Murf and Lorrie are always on the hunt for good deals or hard to find automotive items. 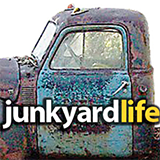 They buy, sell and recycle auto parts from local Tennessee junkyards, Ebay and Craigslist to maintain thousands of parts and hundreds of cars in Under1981.com’s inventory. Murf and Lorrie are saving classic cars and parts that would inevitably find their way to the crusher. Those rescued cars and parts then find their way to restorers and classic car hobbyist around the world. We can all feel better about that. Under1981.com is spray painted on the doors of many of Murf’s cars. Murf pulls any salvageable part before he takes them to the scrap yard. 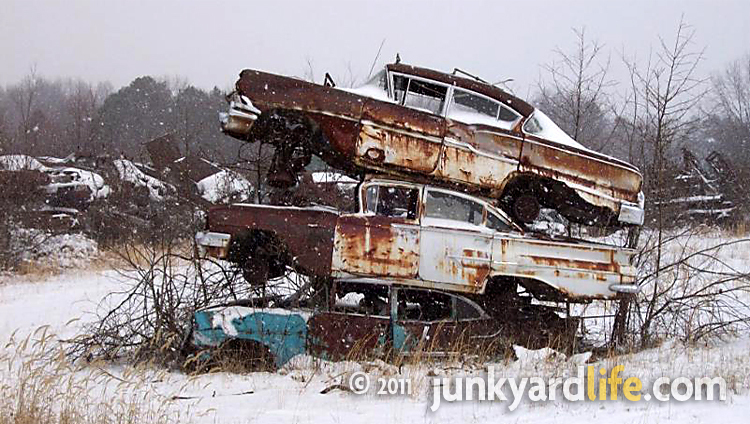 Everywhere you look at Murf’s junkyard you will find classic American cars. A 1965 GMC is Murf’s wife Lorrie’s daily driver. Where - Located 2 hours east of Nashville in Grimsley, Tennessee. 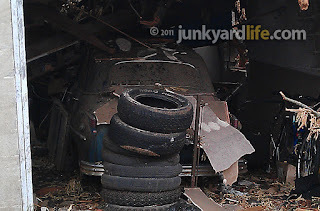 Hours - Murf’s secret junkyard is open by appointment only. Email them. 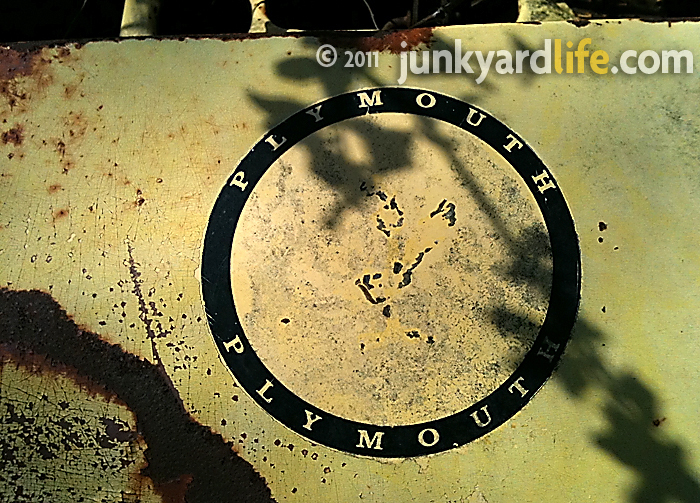 Know of a junkyard I need to visit? Send me an email at junkyardbull@gmail.com. Tornado leaves wake of crushed cars in Alabama. 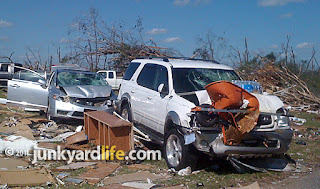 Thousands of cars, trucks and RVs, rolled, flipped and were smashed by trees, debris and houses as they succumbed to the 200 MPH winds of an EF4 tornado. 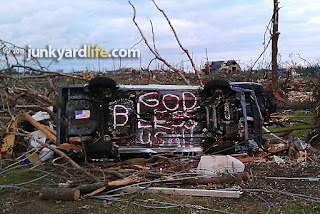 “The world has been turned upside down, shook to pieces, then slung out,” said Tommy Simmons of Pleasant Grove, Alabama. 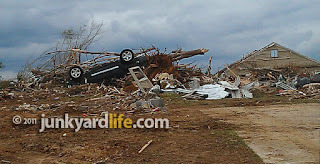 Simmons was surrounded by the sobering aftermath of the April 27 twisters that demolished his parents’ home and tossed his mother’s van over their house. 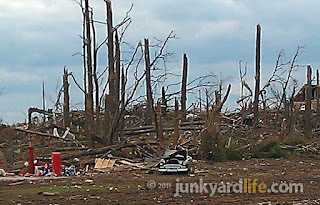 The violent tornadoes killed more than 230 people and destroyed or heavily damaged 14,000 homes in Alabama. 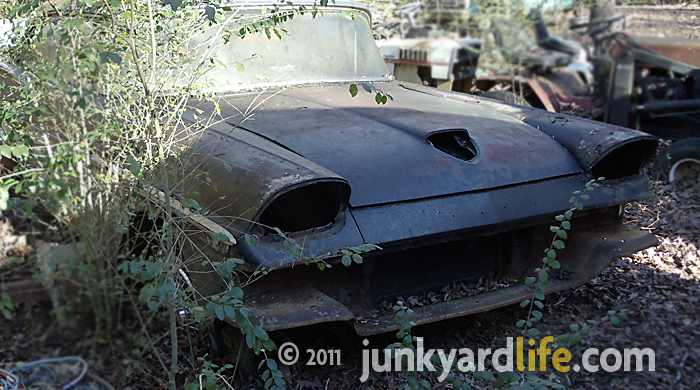 Simmons, a car enthusiast featured in junkyardlife’s “What’s in My Garage,” captured these photos of Alabama’s automotive apocalypse. How fast do you have to accelerate a tennis racket to get it to stab a tire? Check out the handle jutting into the van's tire. 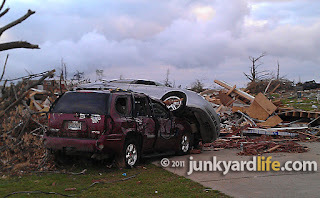 The Simmons' Chrysler Town and Country was blown to the east over the house. It landed on top of a downed tree 30 yards away. The wayward tennis racket belonged to a woman who lived two houses to the west. 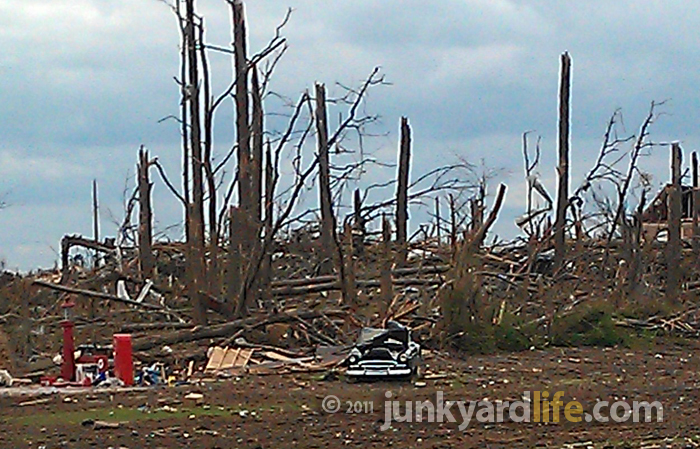 Massive EF4 tornadoes churned everything in their path into rubble. A wheelbarrow slammed into this SUV and remains embedded in the hood. A 1950 Chevy, parked in front of snapped trees that were stripped of their bark, remains upright but mangled by tornado debris. 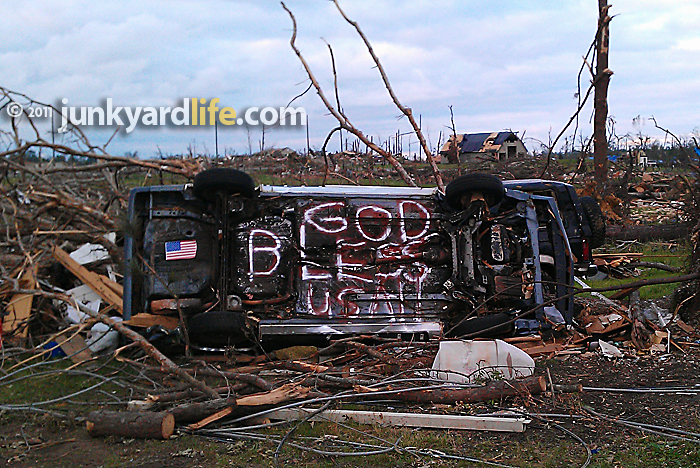 Tornado survivors used overturned vehicles as billboards of inspiration. 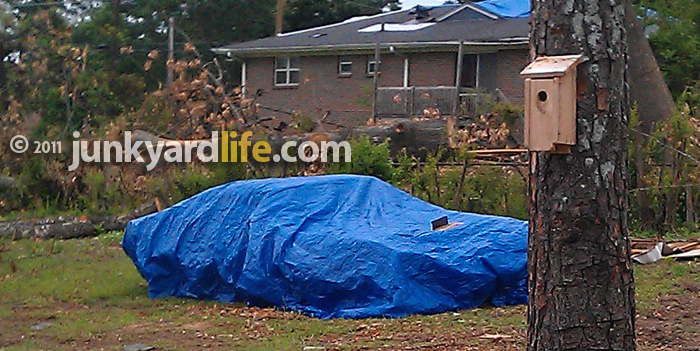 This 1971 'Cuda convertible, damaged during the tornado, will remain covered until the owner is ready to look at his battered, classic muscle car. The partially collapsed roof, caused by a tornado, fell onto a 1949 Plymouth in Pleasant Grove, Alabama. 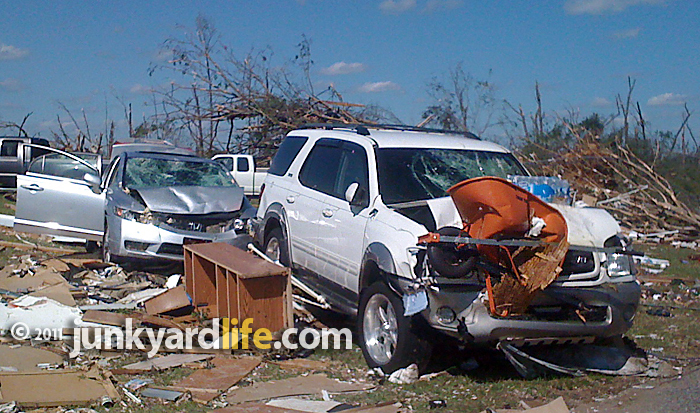 Thousands of tornado damaged vehicles will be scrapped, which will result in used vehicle prices continuing to climb. Junk car buyers will deliver these tornado damaged vehicles to the scrap yard. 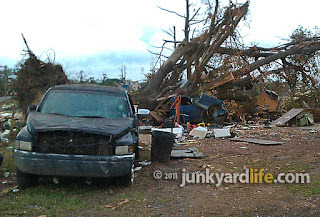 My condolences go out for those who lost their lives in the recent tragedies and also my sincerest sympathies to the tornado survivors who have lost so much. Junkyard find: 1974 Plymouth Road Runner; Hazzard's Daisy Duke, where are you? 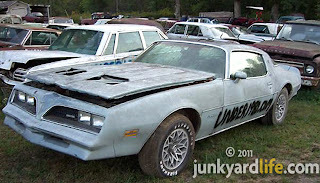 of Daisy Duke's 1974 Road Runner. 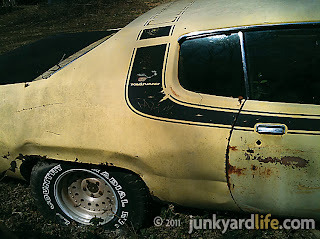 the moment I laid eyes on this Blaze Yellow (paint code KY5) Mopar in a rural Oneonta, Alabama junkyard. It looked exactly like the Plymouth Road Runner that Daisy Duke drove during parts of the first two seasons of “The Dukes of Hazzard” TV series. That show was an adolescent boy’s dream, Feb. 1979 to Feb. 1985, with 147 episodes filled with car chases, a high-flying, orange 1969 Dodge Charger and leggy Daisy Duke in her cut-off blue jean shorts. 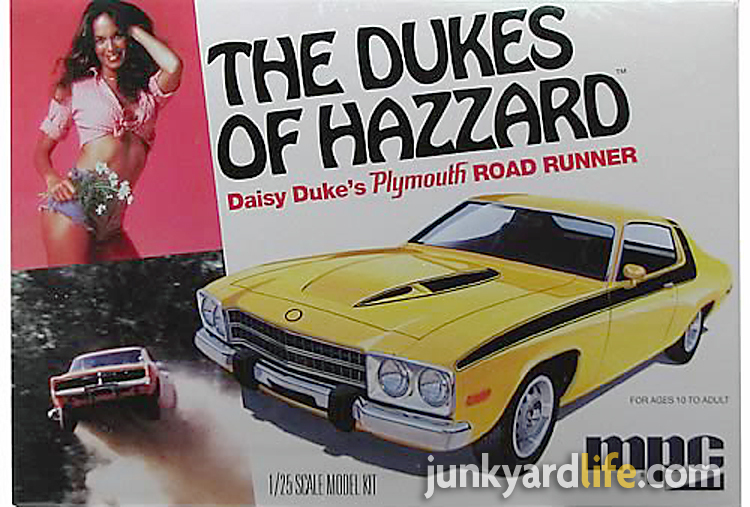 The first episode of “Hazzard” guaranteed that Daisy, played by Catherine Bach, wouldn’t be overlooked. It featured Daisy Duke's most memorable scene as a roadside damsel in distress. Wearing a red bikini and standing beside her yellow Road Runner, Daisy was a distraction that could not be missed. Plymouth built 9,656 Road Runners in 1974.
naming rights, use of the cartoon bird and “Beep-Beep” horn. Daisy Duke arrives at The Boar's Nest in her Plymouth Road Runner. 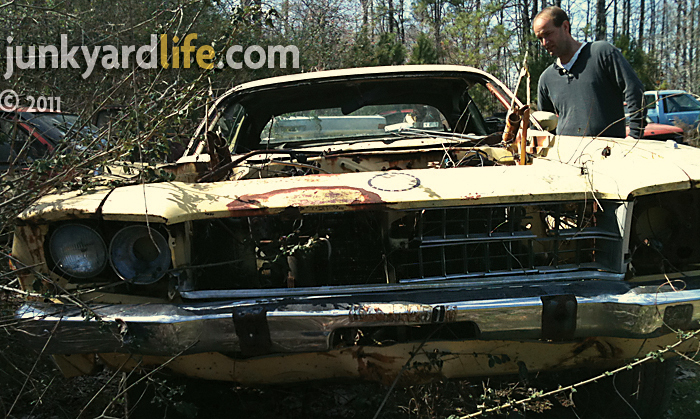 Oddly enough, Daisy’s ’74 Road Runner met it’s demise at the hands of Bo and Luke Duke. It was an accident of course. The brakes failed and Daisy’s Mopar sailed off a cliff just after Bo and Luke jumped out safely. Some insiders think that the TV show’s producers killed the Road Runner because they didn’t want the bright yellow Mopar to detract from the star car of the show, “The General Lee.” Warner Brothers worked out a deal for Daisy to drive a 1980 Jeep CJ-7 Golden Eagle Edition with the nickname “Dixie” painted on each side of the hood. 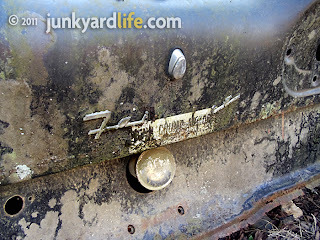 Daisy's white Jeep quickly became a “Hazzard” fan favorite. 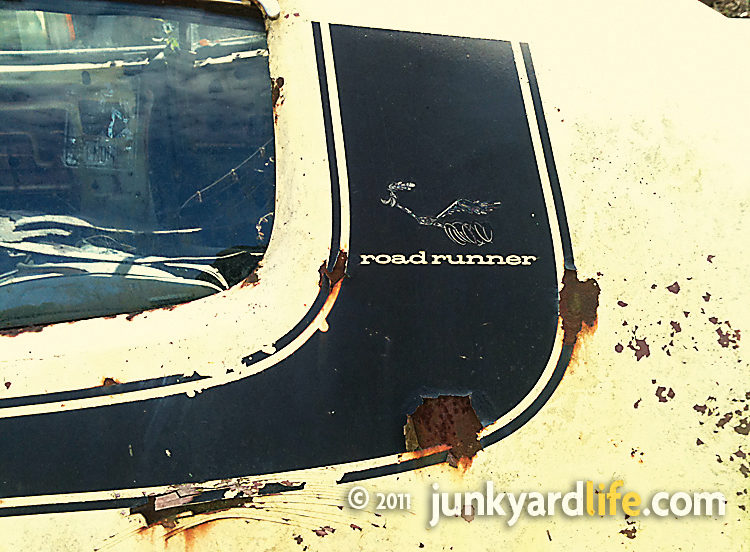 The Jeep, unlike the Road Runner, didn’t have doors to block viewers from seeing Daisy’s long, tanned legs. Maybe killing the Road Runner was a good idea? Worn Road Runner decal on the top of the header panel. On the original decal the speedy bird is holding a white racing helmet. Body rash from straightening too many curves like the Duke boys. 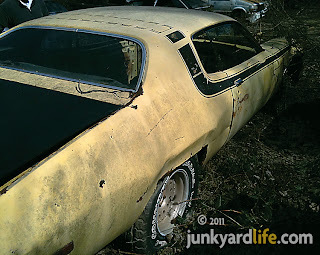 This Mopar find was discovered in a junkyard with two unusual occupants. Horses! Grazing on the tall grass, that was growing between the rows of 200-plus cars, were the junkyard owner’s pets. You really have to watch where you step at this place. 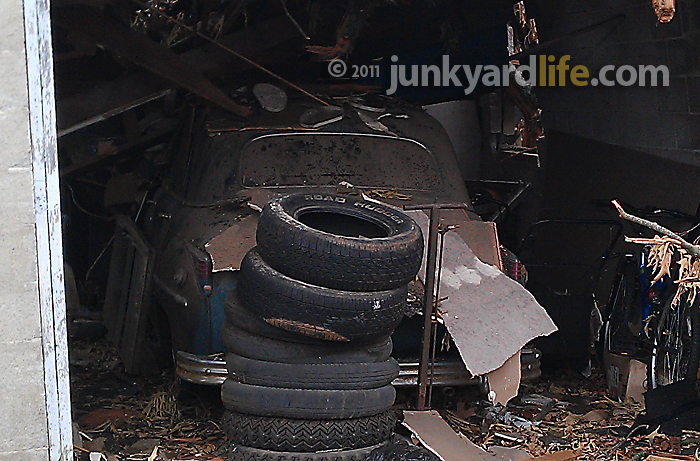 I will post more on this junkyard. 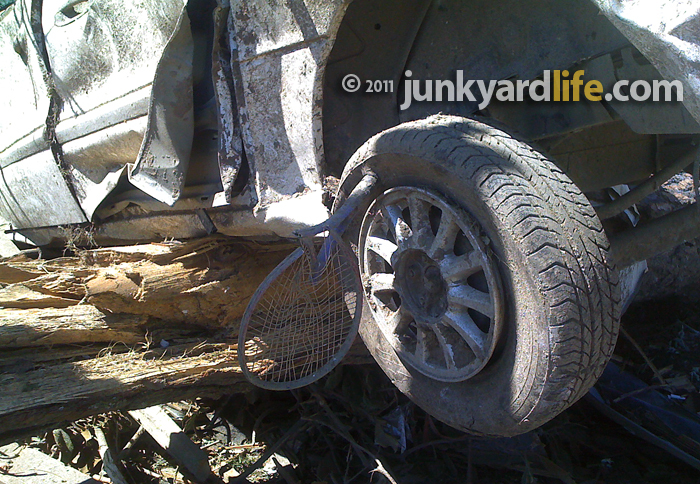 Check back with junkyardlife soon. across the roof, which continued down the body side. 1973-’74 Plymouth Road Runners and Dodge Chargers were equipped with large rubber bumperettes to meet safety requirements. 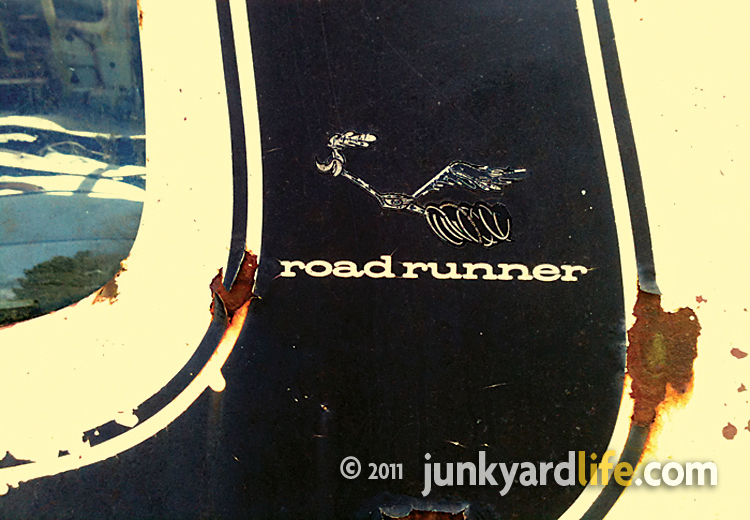 Plymouth spent $10,000 developing the Road Runner’s signature “Beep-Beep” horn. This ’74 Plymouth Road Runner has no drive train, interior or J54 power-bulge hood. 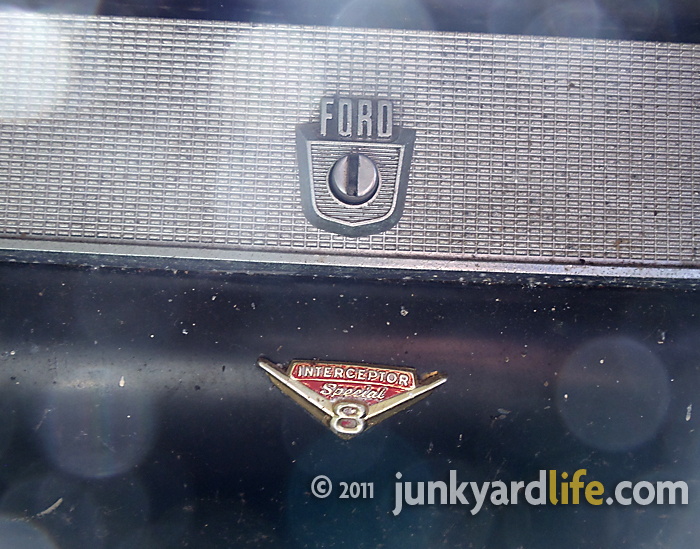 1958 was the first year of quad headlights on Ford Fairlanes. In 1974 Terry Conn was three years old when his dad “gave” him a 1958 Ford Fairlane 500. Terry’s parents, Roscoe and Sheila, came to own the Interceptor model of Ford’s ‘58 Fairlane 500 for safety reasons — the safety of the seller’s wife. 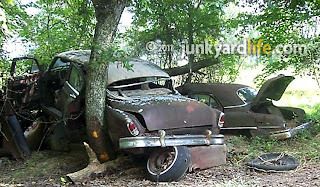 The husband, eager to unload the fast Ford, believed his wife’s driving habits didn’t mix well with the powerful car. Fully redesigned ’58 Fairlanes retained the signature sweeping side trim. You have to look closely to spot the 1958 Fairlane in Conn's yard. The worrisome hubby got bent out of shape every time his lead-footed lass got behind the wheel. The ‘58 Fairlane 500 was equipped with the 300 horsepower Interceptor V-8 and three-speed column shift manual transmission. “The husband said his wife would romp down on the gas along curvy roads and over bridges, and he was afraid she would get hurt,” Sheila Conn said. 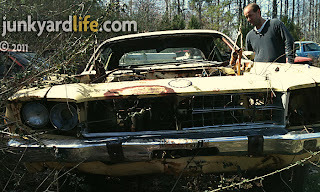 Did this Interceptor V8 Fairlane top 120 mph? Ford went away from the 2 round tail lights when redesigning the 1958 Fairlane. Terry, the Conn’s impressionable three-year-old son, was smitten by the ‘58 Ford. “Terry’s daddy, Roscoe, had somebody interested in buying the two-tone Ford coupe,” said Terry’s mom, Sheila. “When the would-be buyer arrived, Terry cried for his daddy not to sell the Fairlane.” Roscoe gave in and sent the buyer home empty handed. Terry, at three years of age, owned his first car. 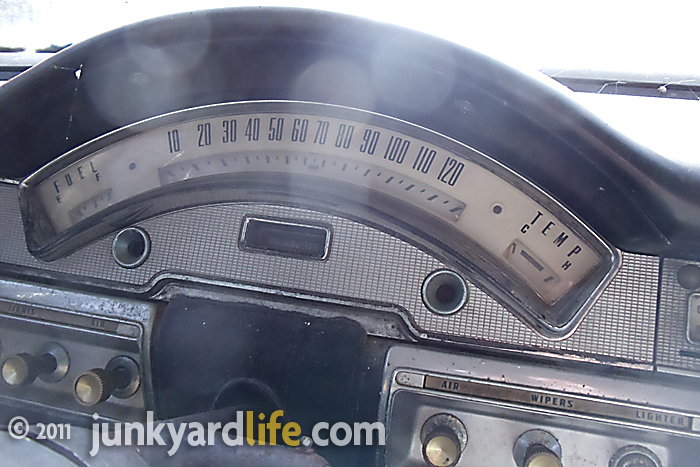 Terry Conn, now 40, still owns the 1958 Ford that captured his imagination as a toddler. 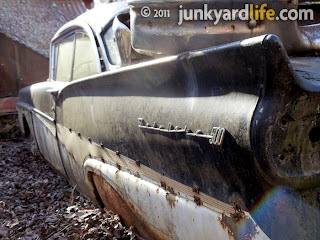 The Fairlane, severely weathered from decades parked outdoors, rests in Conn’s secluded yard with most of the original equipments in place. Conn regrets not putting the Fairlane under a cover years ago. “It would be in better shape if I had a place to keep the car covered,” said Conn. A quick walk around the car confirms the detrimental effects of parking a car out in the weather over a long period of time. 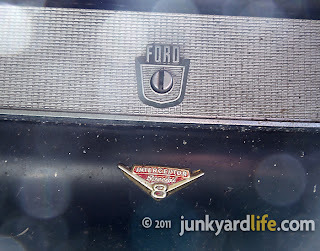 Interceptor Special V8 emblem on the Fairlane's glove box. 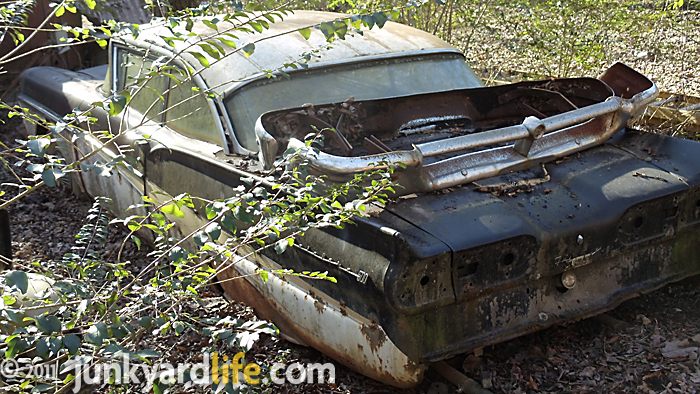 Ford added larger tail fins on the Fairlane in 1958. 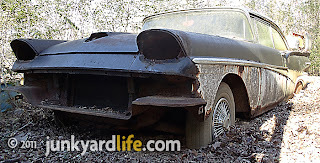 The exterior of the ’58 Ford’s two-tone black and white body is scabbed with rust. The bumpers, tail lights and some trim pieces, which often steal your attention from the ugly truth, have been removed. 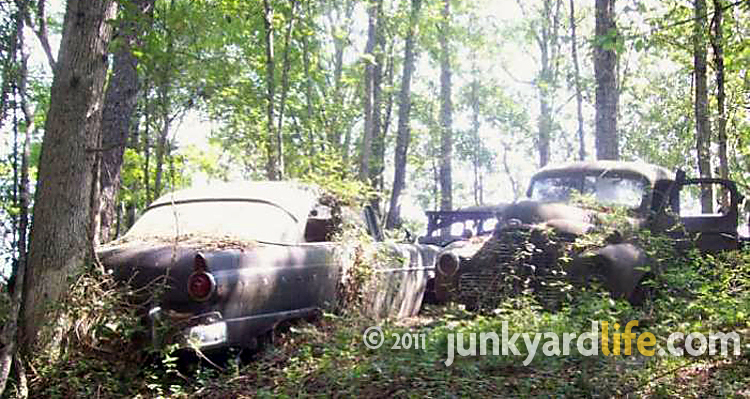 The rocker panels, brushing the leafy nest the Fairlane calls home, continue their slow descent into terra firma. 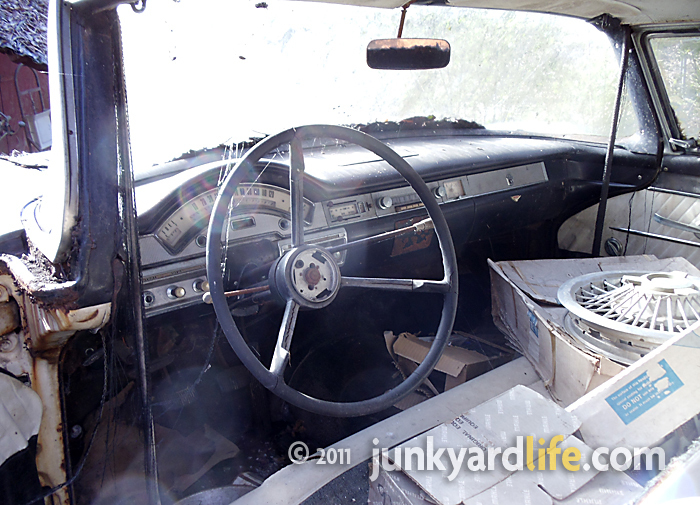 Inside the ’58 Ford Fairlane time capsule. 1958 Fairlane has vinyl seat with tweed inserts. Surprisingly the two-tone upholstery has held up well. 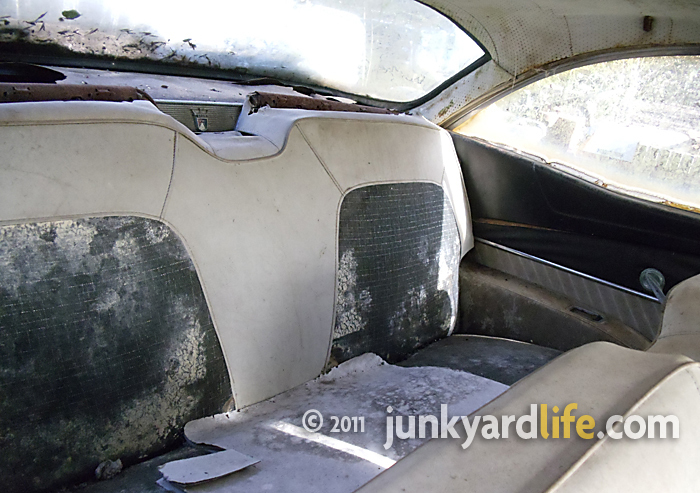 The white vinyl seats with black tweed inserts survived without rips and a minimal amount of mildew damage. Under the hood the scary fast Interceptor engine crowned by the factory Holley 4-barrel carburetor remains but now has late model Cobra valve covers and parts-store plug wires and hoses. The original 352-cu. 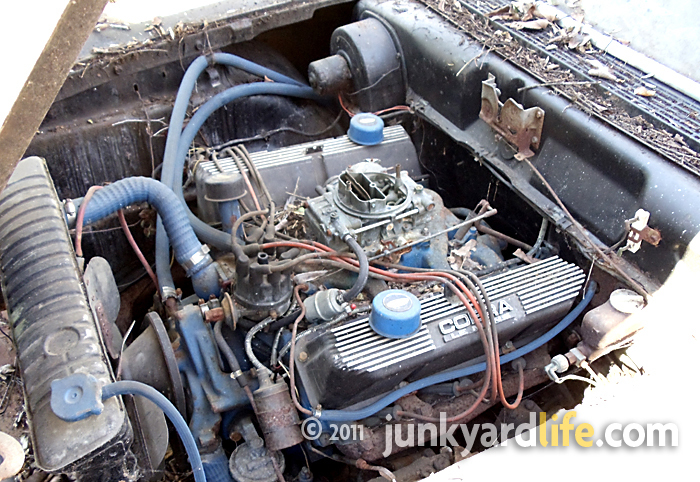 inch Ford engine, with non-original valve covers, remains in the 1958 Fairlane. Conn would love to bring the ’58 Ford back to life with a full restoration. 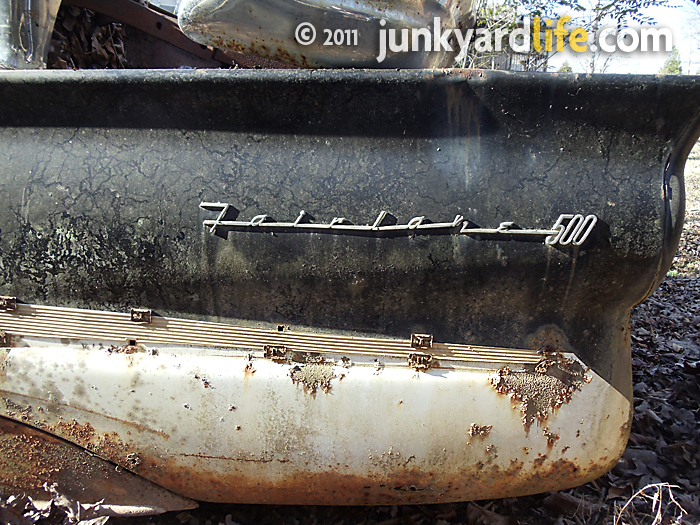 A ‘58 Fairlane parts car was purchased several years ago to help move the project along. Family and work have taken priority but he plans to rebuild the car someday. Conn’s first car will stay in the family whether it’s restored or not. 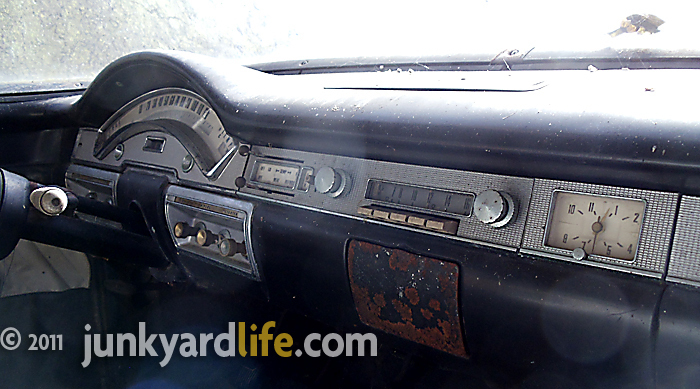 1950s steel dashes weren't crash-friendly to passengers but they are certainly durable. 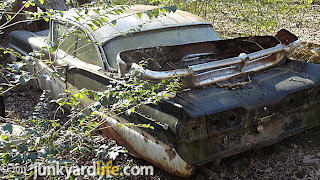 Ford borrowed the dummy hood scoop on ’58 Fairlanes from the Thunderbird. Ford sold 967,945 passenger cars in 1958. 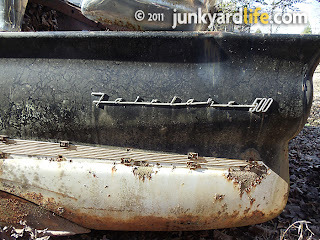 1958 Fairlanes were completely redesigned even after selling more cars than Chevrolet in 1957. 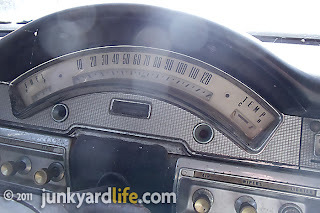 Three speed column shift transmission in this 1958 Ford Fairlane. Bumpers and trim have been removed for future restoration. 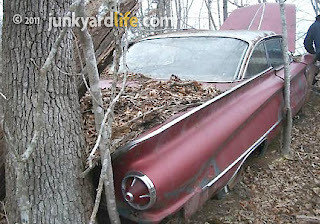 Notice the '58 Ford Fairlane 500s ribbed roof? 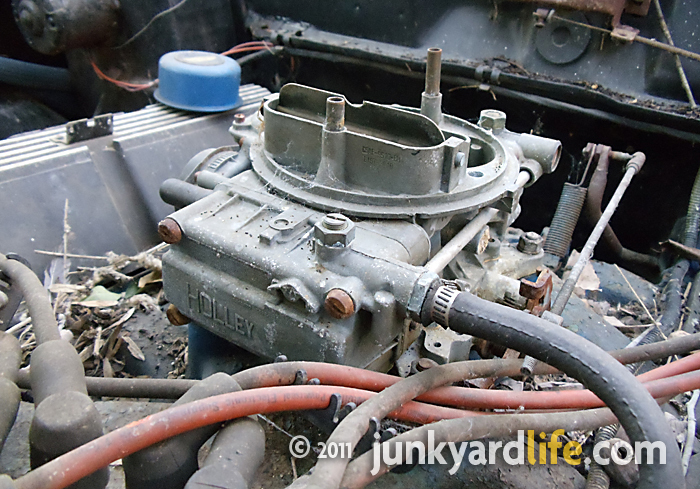 A Holley 4-barrel carburetor, original 1958 equipment, tops Ford's 352-cu. in. Interceptor V8 engine.